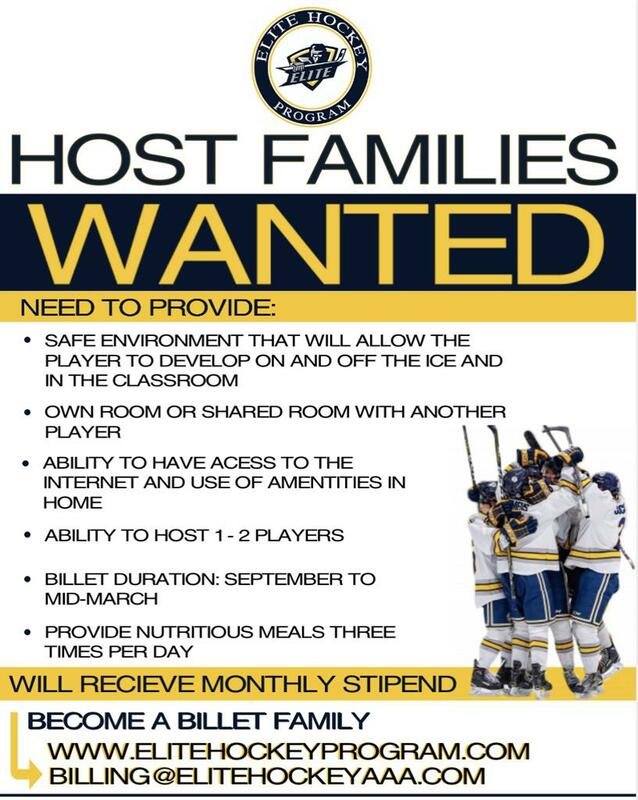 Guilford, Conn., - It's that time of year again where we are looking for billets to host our players while they are playing for Elite Hockey Program for the 2019-2020 season. Players will come player for the Elite Hockey Program from all over the country. The players ages 18-14 y/o will live live with these billet families in Connecticut from August to March. Billet families are a big part of our program and are crucial to our success as a program. In order to become a billet, you must first have a background check done. After you pass this background check, the players that are selected to play for our program will be matched with the families that are best suited for each player. Our coaching staff will visit your home periodically throughout the year. This will allow bonding from the coach, player, and for the family that is crucial to our success as a program. Billets will be required to provide a bedroom for your player, but you can put more than one in a room as long each player has its own bed. You will be provided a monthly stipend for room and board that is typically $650 - $750 per month. We also look for you as hosts, to provide the emotional support that our players need throughout the season. Players can bring a car if they have one, but if they do not have a car. Players will carpool whether that is to school, practice, or games. We encourage you to set rules and expectations for these players. These are teenagers that they need structure and rules and if the players don't follow these rules they need to be held accountable. Reach out to Peter Alden at Palden@EliteHockeyAAA.com if you have any questions. You can also find us on Twitter, Instagram, and Facebook if you have other questions.